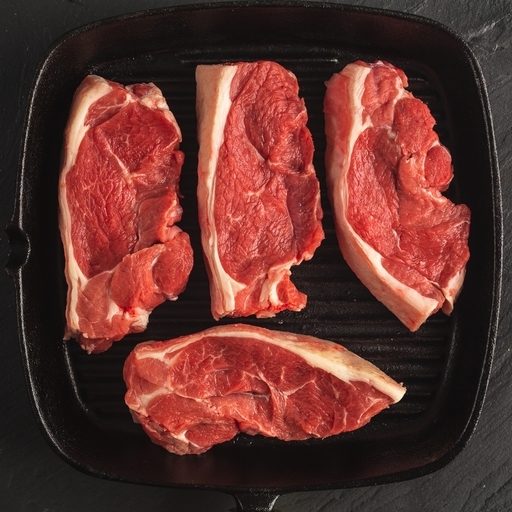 Fresh organic lamb leg steaks from the Riverford butchery. Beautifully lean and succulent, they’ll grill, fry or barbecue in minutes for speedy weeknight cooking. Good with seasonal greens and potato in all its forms. Approximately 4 lamb steaks per pack. Brush with oil, season well and fry, BBQ or grill (medium to high heat) for approx. 4 mins per side for medium. Leave to rest for 5 mins before serving. They like strong flavours, such as rosemary, mint or capers, and bold spices (North African in particular).